The ancient emperors of China employed royal springs reserved for use within tea brewing. They evaluated the water from different locations. Over the centuries, Chinese emperors have been particularly fond of ranking different water sources all over the country. Emperor Qianlong of the Qing dynasty, had a set of silverware specially made for measuring and calculating the weight of spring water from various locations in the country. He then issued an imperial proclamation announcing his findings. Supply of superior quality water was an important part of the tea experience from ancient times to present day. The quality of the water is the main and most important ingredient to the tea making process. It will affect the overall flavor of the infusion regardless of high a quality the tea leaves may be. 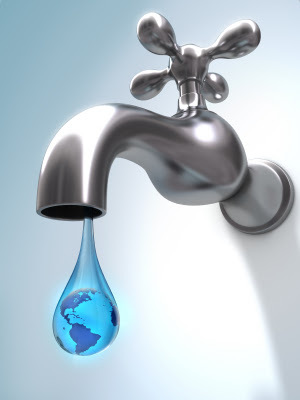 There is an immense amount of difference between water from different sources, in term of its quality and property. Water for tea that is considered superior needs to be clear, original, live, sweet, and light. Clear means clean, free of any impurities. Original means the water must be collected from the origin of the stream. This is usually quite a difficult task. You would have to be close to the source of mountain spring. Live water means flowing water. However according to tea tradition, the Chinese ruled out waterfalls, because it was considered to be violent, too turbulent and incompatible with the nature of tea. The best live water is normally naturally flowing spring water. Water with a natural subtle sweetness is deemed most desirable. Light means that the water should be relatively light in viscosity and weight. This is quite sensible from the perspective of modern science. Light water has lower mineral content, and it closer approximates soft water. The best water for brewing tea came from the center of a swiftly moving mountain stream. sought after among tea connoisseurs. 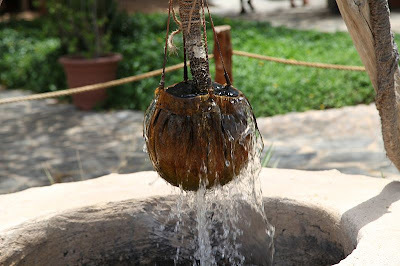 Natural spring water is what is considered very soft water. Very soft water has a minimum amount of natural minerals. produce a clean flavor and is aesthetically enhanced. 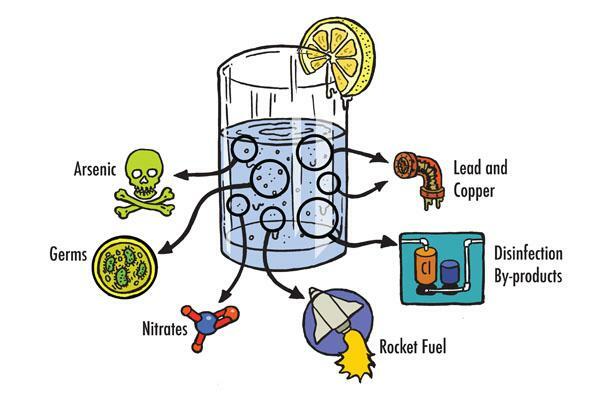 by metal ions and other ground contaminants are also good choices. A good quality spring water is an optimal bottled water for tea brewing. The best spring water for tea should be neutral in pH (about 7) and in flavor. It should have a Total Dissolved Solids (TDS) content of 30 parts per million (PPM) or less. Oxygen and temperature are important in brewing tea. Aeration is particularly essential when making fine teas. Water needs to be aerated - high in oxygen. is needed to improve the flavor of tea. It is advised that re-heating or over boiling water should be avoided. 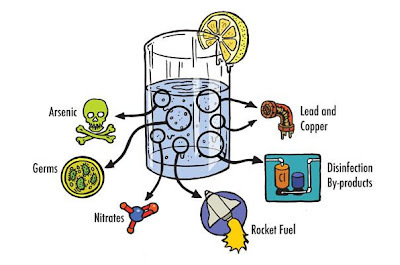 Previously boiled water will have lost much of its dissolved oxygen. When water is boiled, oxygen evaporates. 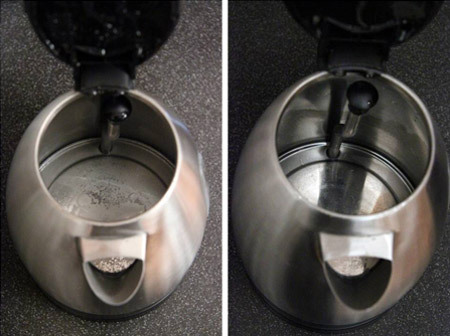 The flavor of tea is reduced or lost when aeration in the water is diminished. Oxygen is important as it can enhance the flavor of tea. Always use freshly drawn water when possible. Use water that has not been previously boiled or enclosed in a container. This will maximize the oxygen content of the brew. Fresh, cool water has more oxygen, less contaminants. Hot water from the tap is diminished in aeration, therefore oxygen content is low. 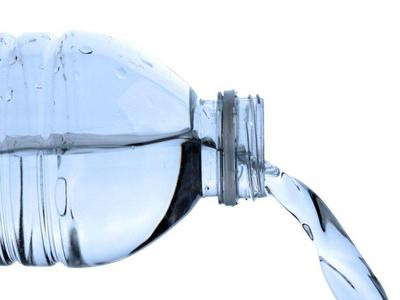 When using bottled water it is best to aerate the water into a container made of glass or ceramic. This will generate more oxygen into the water prior to boiling. Aside from the quality and property of water, preparing tea also requires the sophistication of understanding about how the difference in temperature and amount of water might make significant differences in a tea infusion. The Tea Sage Lu Yu differentiated three phases of water boiling. Phase One: When the water just starts boiling, small bubbles resembling tiny fish eyes hiss as they float to the surface. Phase Two: Strings of bubbles rush to the surface like a fountain. Phase Three: When the water seethes and spurts like rolling waves. If the water is boiled any further, it would be considered old stale or overdone due to loss of oxygen content and is considered inappropriate for making tea. 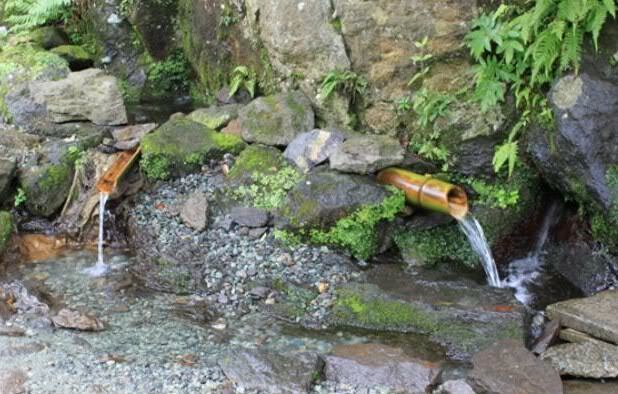 unpolluted natural spring water, snow or rain water. Both river water and well water are usually somewhat polluted and mineralized. Neither of them has what it takes to make excellent tea. Water from rivers, lakes and wells, which usually contains alkalies and iron, is usually considered unacceptable by tea purist. Water that contains high levels of calcium is called hard water. Tea made from hard water reacts with tannin and caffeine, causing the taste to become bland and reduces aroma. The brewed tea will also be murky acidic or neutral to alkaline when litmus tested. Hard water is saturated in dissolved minerals, especially calcium and magnesium. These mineral deposits accumulate in the water. They adversely affect the flavor and quality of the infusion. The mineral deposits become evident and accumulate in teapots and kettles. Heavy mineralized water will influence aesthetics of a particular tea by making it dark and dirty. High mineral content bottled water gets the same negative affect on tea. Bottled water has limited amount of oxygenation. Bottled water is always a good back up to have on hand when hard water is present. leave the tea flavor metallic or harsh. Distilled water is too soft - low in minerals - and will brew into flat-tasting tea. to prevent the unwanted flavor of extra minerals. Well water pH is almost always above 7. Test all water with a litmus paper. If the pH is above about 8.5, it is hard water and it will brew into bitter tea. Always best to invest in a good filter it for such situations. Sometimes boiling the hard water after filtration may still yield the aroma of minerals. Then bottled water is your best bet. Filtered tap water is the best option for brewing tea when live water is not available. Some neutral-tasting tap water may not even need to be filtered. The water supply in the US generally comes from one of these three sources: Municipal water, spring and well water and bottled water. However, due to the presence of harmful nutrients from tap water like chlorine, pharmaceuticals and high mineral content a reliable filtration device should be employed to obtain cleaner and purer water. If filtration is not available, it is the advisable to put the water in a ceramic or glass container and let it settle overnight before boiling it for infusing tea. During the Song dynasty, people were immensely fond of the tea-fights. These were actually competitions among groups of friends. The goal was to see who could brew the best tea infusion. Cai Xiang, a prominent calligrapher and Tea Master during the Song dynasty, attended a competition. He brought with him the best tea and Spring water from Mt. Hui - considered to be superior and excellent water for tea. Su Dongpo was a poet and Cai Xiang's friend. However Su Dongpo did not have a good quality tea but brought with him bamboo-filtered water. This water proved to be his trump card as he won the competition. collected diligently from bamboo trunks. rarely has many endeavored to achieve it. 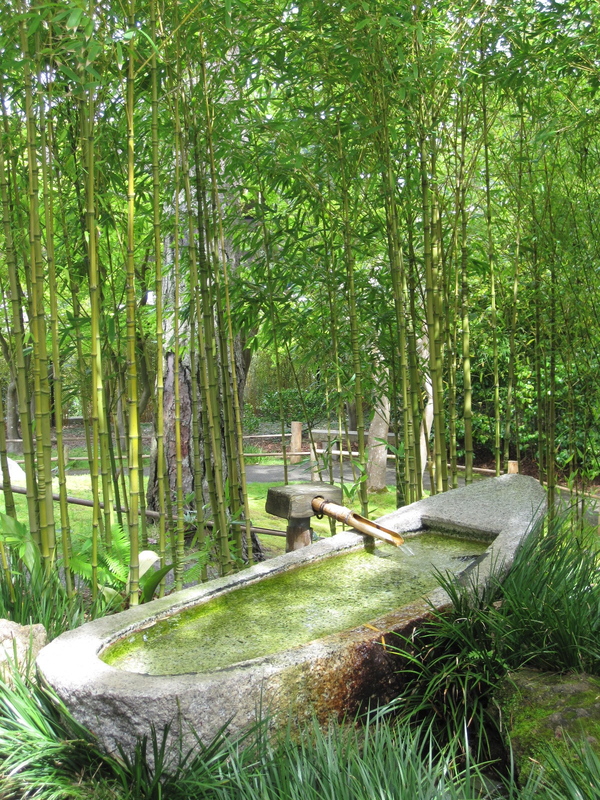 One of the ways to achieve this when a bamboo grove is not available is to use bamboo charcoal. 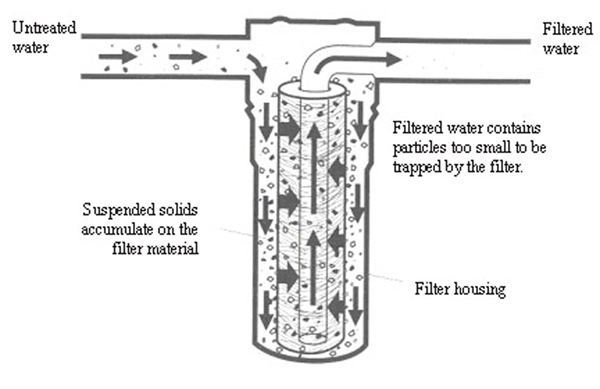 It is basically more than a simplified carbon filter. 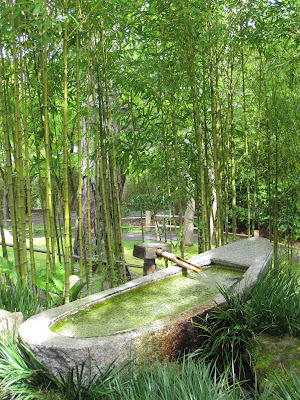 Bamboo charcoal has been used from ancient times in China for "sweetening" the water. Water has an absorptive quality to it - it will absorb odor over a period of time especially when the origin of the water is contaminated in some form. This mal-odour will affect the tea infusion. One piece of bamboo in 2 litres of water will filter water and add minerals such as potassium, magnesium, sodium, and calcium. It also helps to decompose toxic substances in water and releases Far Infared Waves (FIR) into the water which aids in blood circulation. 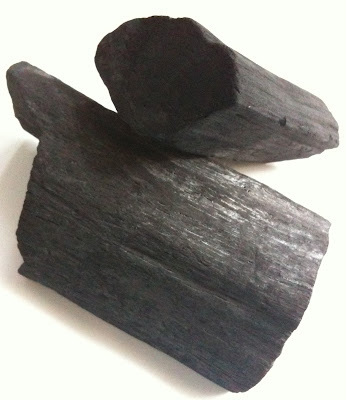 Bamboo charcoal can be used for up to two weeks before it needs to be replaced. Bamboo charcoal can absorb this odor - takes about 6 - 8 hours for this to occur when a piece of bamboo charcoal is dropped into the container of water. Boiling the water with a piece of this bamboo charcoal will further assist in the process of odour removal as well as infusing the natural minerals that has a closer link to the terroir of the tea. When water is boiled with the bamboo charcoal it accelerates the negative ion exchange between the charcoal and the water. Keep the boiling time to a minimum to avoid loss of aeration to the water. 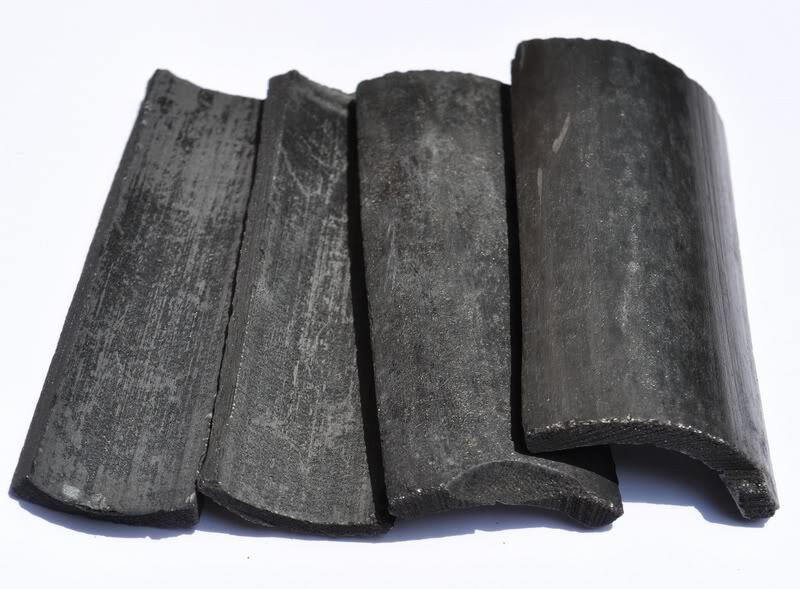 It is best to use bamboo charcoal on a mineral poor water. Leaving it longer in the water may cause the water to turn hard - which is counter productive to what needs to be achieved - reducing chemical contamination, odour and imparting minerals that are native to the region tea grows, thereby enhancing the real flavor of the infusion one who get should regional water be used. The tea leaves will infuse best when they are re-hydrated with the same water that was used to nourish and nurture their growth. It is always recommended to filter even the water that comes out of every household tap whether for tea or just normal everyday consumption. Filtration reduces minerals - that causes water hardness, chemicals that have been added to kill and control microbe growth. 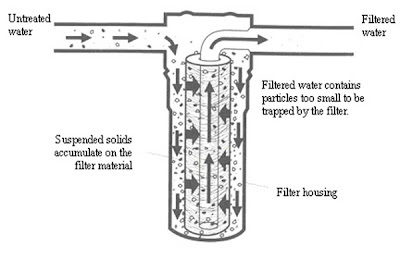 Commercial carbon filters can be purchased that has the ability to reduce chlorine taste as well as odour and chlorine by-products, contaminant metal like mercury, lead as well as up to 99% of trace levels of pharmaceuticals, industrial chemicals like Carbon Tetrachloride, pesticides, microbial cysts and natural minerals. PUR makes a great faucet mount filtration system. Reverse osmosis systems are is a membrane filtration method, a natural process that applies itself through pressure. Choose one that is best to your budget and needs. what they consider a good cup of tea. This adds a better balance of minerals to the water and the final brew. Aside from bamboo charcoal, oak charcoal from the Yunnan region is also employed for changing and enhancing the flavor of water and tea. As soft water produces flat-tasting teas, warm soft water with certain types of rocks in the kettle can also change the flavor of the infusion. Some even use gemstones and semi-precious stones - like jade, immersed in store water to enhance the potency of tea. Objects like tea kettles, teapots and water storage containers can also influence the water - clay, silver or cast-iron kettles can also make slight nuances to the water that then influences the flavor of tea. Fuel to fire to water! Methods of heating the water is also another factor that can affect the flavor of tea in the most subtle manner and is discerned by the most sensitive of palates. Traditionally water was heated with a wood burning clay stove. Charcoal flames provide vital energy - Chi to water. The traditional Chinese Tea Masters believe that water can be enliven by certain elements. Like using natural spring water which in itself is live water. Then method of storage - natural substances like ceramic or clay or glass versus plastic containers will further allow the water to stay aerated and fresh. Stagnant or old water loses its vitality. of the tea plant will enhance the flavor of the final infusion. in the water intended for the tea. It is considered the peak of one's tea making skills when a charcoal clay stove is used. It takes skill and greater patience. 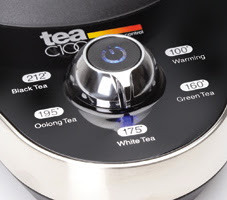 Boiling water in the microwave is considered unsuitable due to the main fact that being able to control the temperature of the water is crucial in making tea. Different varieties of tea require varied temperatures for infusing tea. Technically, freshly boiled water over a quick fire is best for brewing tea. Green teas and the more delicate the tea leaves are, the lower the water temperature needs to be. The most famous green tea Longjing must be infused with water in its first phase of boiling. The temperature at this phase is around 85 degrees Celsius. needs to be between 90 and 95 degrees Celsius. Amount of water used for infusing tea varies with personal taste. A stronger infusion will require less water and more tea leaves. A weaker infusion will require the opposite. However, different types of tea call for different amounts of water. For green or black tea a teacup that is 200ml will require about 3 grams leaves. Water is filled up to 70 percent of the brewing vessel. Oolong or Pu’erh, will require more water. Tea bags containing broken bits of tea leaves will require more hot water immediately. Using an electric glass tea kettle would be a suitable substitute. Electric kettles have temperature controls. 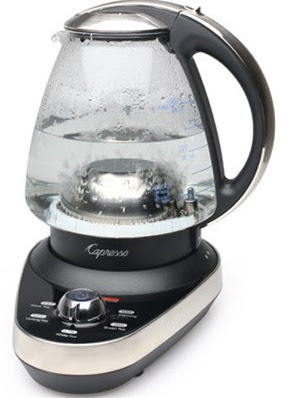 Capresso has a new tea kettle with varied setting. Nonetheless, you are still at the mercy of the kettle's temperature gauge. One solution is to heat the water to boiling and then let it cool to the desired temperature. if only slightly gives a stale, flat taste to tea. Therefore, it is wise to follow Lu Yu's advise on boiling water. That is part and parcel of development in the Art of Tea. The fact to remember is that 99% of tea is water. crucial ingredient to the ultimate results of tea preparation. Brewing tea can be complex and simple. For tea connoisseurs the brewing process is an integral part of the tea experience. It culminates in the preparation of an enjoyable beverage and a method of living. The very best and superior water for a tea infusion is reduced in mineral content, free of additives, contamination and saturated in oxygen - aeration.